Glowfly Dance is the story of a mother trapped in an abusive relationship, a family terrorised by one man, imprisoned without a possibility to escape. When the mother and four children do escape, they are tracked down, and back into the fold. Mother and children follow him to a new job abroad, to Libya and then the Caribbean, in the hope it will at least allow them to stay together, and to survive. They try, they adapt, both mother and children bear the abuse and learn to become stoic, and terrified. The two attempts at fleeing are triggered not by beatings or cruelty, but by sexual harassment of the children. That is the line the mother draws. But it is impossible to escape, the police are useless, as is the law, and in the end, she is beaten up and stabbed to death while visiting her two youngest children who were ordered to stay with their father. The police should have come with her, by law, to provide protection, but they couldn’t be bothered. She took the risk and went alone in order to make sure her two youngest children were alright and not being abused, but we will never know if they were. She never made it out of the house again. He escapes justice, yet again, as the law gives him the benefit of the doubt, and he even gets custody over his two children, taking them to his home country, Morocco. The two oldest, of different fathers, are send back to England to live with an uncle whom they do not know. Glowfly Dance is a rare book that allows us to peek into the world of domestic abuse via a very personal narrative. Gibson was a witness, she was there, this is her story, and there is tremendous power in a story that recalls in such detail twists and turns of living daily life in an abusive home. Gibson manages to find a tone that is intimate and engaging without becoming dramatic or sentimental, quite an achievement considering the subject matter. Without going into academic arguments or elaborate research, the story shows how hard, even impossible, it can be to escape an abusive relationship if a mother has no access to her own income and marriage is considered a duty, if the authorities dismiss the severity of the violence, or consider domestic abuse not worthy of their attention. The novel also, importantly, puts children into view: something many researchers of intimate partner violence overlook. The story is told from the perspective of the eldest daughter, Mai, who sees it unfolding until the end, when she is fourteen. Mai is also subject to physical abuse and sexual harassment and witnesses how her mother and younger siblings are being manipulated and terrorised. But she talks about her mum as a caring, resourceful and tough woman the children love more than anything. Children are children, they are resilient, they play on as best as they can, until the final blow: it is done, over, she’s dead, and the fear is gone. While the author, Jade Gibson, suggests that Mai, her alter ego, finds some form of freedom from the killing of her mother and the departure of her stepfather, it is difficult to believe that this freedom is more than a freedom of fear. If we want to understand what domestic abuse and femicide does with the children in the middle of it, we also need to learn how they cope afterwards, or not. What happens to the two younger siblings, taken to live in Morocco, how do they grow up in the knowledge what their father did to their mother, having witnessed the killing? How do the two older sisters, back in Britain living with people they do not know, process what they lived through? How do you establish intimate relationships, when all you have seen is that they can kill you? How does one get over this, and become a responsible-enough adult? Jade Gibson knows, and I hope she will write this up in her next book. 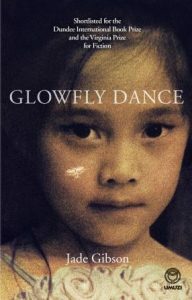 Glowfly Dance is currently only available in South Africa, as that is where the author built her life. The book deserves much wider distribution though, as this is a story of international appeal. The author is open to referrals for international publication. Excellent review of a brilliant book. It might be worth mentioning the time the story was set in – the 1970s, both for commentary on how times and attitudes have changed, and for commentary on how they have stayed the same.